Healthy emotional and relational boundaries are key to having successful relationships and dealing with life well. The following Ten Laws of Boundaries provide principles for learning and applying healthy boundaries. – Our actions have consequences. – We are responsible to each other, but not for each other. – We have power over some things; we don’t have power over others (including changing people). – If we wish for others to respect our boundaries, we need to respect theirs. – We must be free to say no before we can whole-heartedly say yes. -We need to evaluate the pain our boundaries cause others. – We take action to solve problems based on our values, wants, and needs. – We will never get what we want if we focus outside our boundaries onto what others have. – We need to take the initiative in setting limits rather than be passive. Adapted from Boundaries by Henry Cloud and Dr. John Townsend. 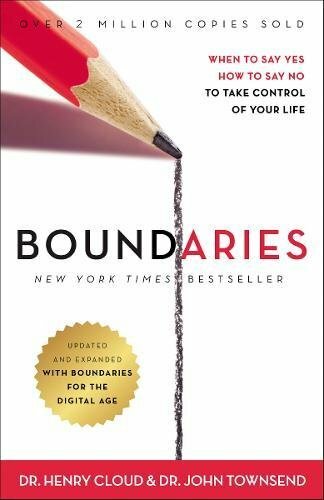 This website contains articles, videos, and resources on the topic of boundaries. This 253-page book addresses how spouses can build a healthy relationship. This book is especially helpful for individuals who have a spouse who isn’t interested in working on the relationship. This 223-page book helps parents learn to set healthy limits with children. The goal is to help children learn to take responsibility for their actions, to be respectful of others, and to develop Christ-like character traits.